It's friday night and I've been running around all day, I'm too tired to be in the kitchen for long so for dinner tonight, we're having Beer and Onion Brats with Salad. Quick, easy and OH SO GOOD! Place the brats in a nonstick pan, cook on both sides for a few minutes, until brown. Add the onion and beer, cover, turn down heat and simmer for 15 minutes. Drain the beer into a colander, return the skillet to the stove, add the olive oil and fry for a few minutes until onions start caramalizing. Serve on your favorite bun. Spread a little mustard and smother brat with the cooked onions. 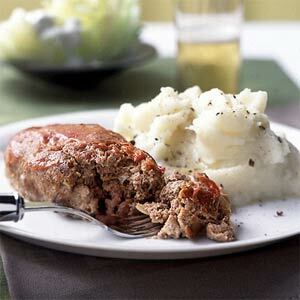 There's something so utterly comforting about a meatloaf isn't there? But I like to mix things up sometimes, and making mini meatloaves is the perfect way to get the right portions for my kids.....and with this recipe I get in their veggies too. In a bowl combine all the ingredients. Shape into small loaves and bake at 350 degrees for 20 to 30 minutes or until the juices run clear. Top with ketchup and serve with mashed potatoes or fries or whatever you're in the mood for. I usually make the Honey Pizza Dough, which you can find here in my recipes. I've been making that one for years and it's my family's favorite. It's fluffy and it rises beautifully. But sometimes when I'm in the kitchen doing my freezer cooking on the weekends, I throw this one together and pop it in the freezer. This recipe will make 8 individual pizzas, all you need to do is make the dough, divide it into 8 balls, flatten them into discs and then freeze them between sheets of wax or parchment paper. When you want a quick meal, pull one from the freezer and add the toppings and bake. DONE! I'm going to give you the original recipe that can be found on Martha Stewart's site, but I tell you I don't follow it to the letter. 1. Place water in a large bowl; sprinkle with yeast. Let stand until foamy, about 5 minutes. Brush another large bowl with oil. 2. In bowl with yeast, whisk sugar, oil, and salt. Stir in flours with a wooden spoon until a sticky dough forms. Transfer to oiled bowl; brush top of dough with oil. Cover bowl with plastic wrap; let stand in a warm spot until dough has doubled in size, about 1 hour. 3. Turn dough out onto a well-floured surface. With floured hands, knead until smooth, about 15 seconds; divide into two balls. 4. Set balls on a plate (they should not touch); freeze until firm, about 1 hour. Then freeze in a freezer bag up to 3 months. Thaw overnight in refrigerator. 5. Divide each ball of dough into 4 pieces. Using your hands, stretch each piece into a 5-inch disk (if dough becomes too elastic to work with, let it rest a few minutes). Freeze shells on two parchment-lined baking sheets. Stack frozen shells between layers of parchment paper. Freeze in a freezer bag up to 3 months. Bake from frozen. Made them into discs, froze the ones I wasn't using and then rolled out the others for us for lunch. The kids love homemade pizza because they get to put their own ingredients and do whatever they want, like smiley faces. Mommy and daddy decided to turn theirs into calzones. YUM....all we did was put all the toppings that we wanted and then folded the dough over and pinched the ends to seal. A stick to your ribs kinda meal....so filling and delicious. Saute green pepper, onions, celery and parsley in reserved bacon drippings in a skillet over medium heat until tender. Stir in bacon, sausage and next 7 ingredients. Reduce heat; cover and simmer 30 minutes, stirring occasionally. Serve over cooked rice. Serves 4. Rich, creamy and the best baked spaghetti you'll ever taste. This recipe is for 12 servings so I made only half the amounts and even then, it's a lot of spaghetti, which is going with Curt to work tonight. Combine spaghetti noodles, spaghetti sauce and ground beef in a large bowl; set aside. Melt butter in a sauce pan over medium heat; add flour, Parmesan cheese, salt and garlic powder, stirring constantly until smooth and bubbly. Add evaporated milk and one cup cheddar cheese; stir until thickened. Pour half of spaghetti noodle mixture into a greased 13"x9" casserole dish and pour the cheese mixture over top. Pour remaining noodle mixture into dish; top with remaining 2 cups cheddar cheese. Bake at 350° for 25-30 minutes. Serves 12. I absolutely love Calamari but it's not often that I make it, mainly because it's one of those things that if you don't buy already cleaned and ready to cook, it is time consuming. But once in a while, I don't mind. I came up with this recipe earlier because what I originally had in mind was to fry the calamari rings, but I didn't feel like fried food and wanted something more of a stew, so this is what I came up with. So good! In a large skillet add a little bit of olive oil, the calamari and the onion. Cook for a few minutes, then add the remaining ingredients and cover. Simmer on medium to low heat for about 45 minutes or until calamari is tender. Keep an eye on it and stir it once in a while, making sure there's enough liquid in there, if need be, add a little bit of water at a time. When the calamari is ready, check to see if it's too watery, if it is, you can just dissolve some cornstarch in a little bit of water, add it to the skillet and stir constantly until the gravy is thickened. I served mine with Garlic mashed potatoes and I also sprinkled some parsley on top. When I get tired of the usual Pork Chops recipes, I go back to this one. It's one of those real down home comfort dishes that leave you licking the fork and begging for more. So quick and easy to make too. Season the pork chops with salt, pepper and paprika. In a large skillet, add a little bit of olive oil and cook the chops slowly until brown. When the chops are brown, drain off the excess oil and then add the onion/mushroom soup, the celery and 1 cup of water. Cook for 30 minutes over low heat until the pork chops and celery are completely cooked through. In the meantime, in a small bowl, mix the 1/4 cold water, the flour and the parsley. Remove the pork chops to a serving dish and keep warm. and the flour mixture to the drippings in the skillet and stir until combined and thickened. Pour over the pork chops and serve immediately. You can serve it with mashed potatoes or fries or rice or noodles or whatever you like. Because Nicholas is a HUGE rice fan, that is what I served with the pork chops. Yum Yum! Wonderful recipe from Gooseberry Patch. The kids liked it but did complain that it's a bit spicy for them, I'll have to play around with it next time to make sure they'll eat it. Cook sausage and ground beef in a large skillet over medium-high heat, stirring until meat crumbles and is no longer pink. Drain. 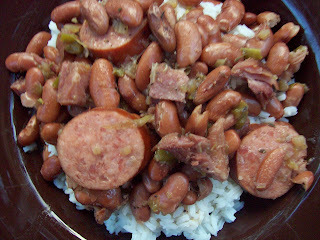 Stir in jalapeno and next 5 ingredients; cook until thoroughly heated. Stir together soups and enchilada sauce in a saucepan; cook until thoroughly heated. Spoon one-third of sauce onto bottom of a lightly greased 13"x9" baking dish; top with 6 tortillas. Spoon half of beef mixture and one-third of sauce over tortillas; sprinkle with half of Cheddar cheese. Top with 6 tortillas; repeat layers, ending with tortillas. Sprinkle with Monterey Jack cheese. Bake at 350 degrees for 30 minutes. Serves 6 to 8. I do my grocery shopping on the 1st and the 15th of every month, so I shop for two weeks, it's easier for me to do it this way than shopping every single week. 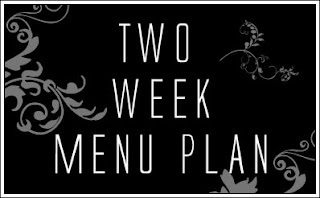 Here is my menu for the next two weeks......with almost all the meals from my new Gooseberry Patch Cookbook.